Rocky, as seen in the picture to the right, recently received his American Championship. He is approximately the structure of a 4-1/2 to 5 pound Yorkshire Terrier. He has a gorgeous heavy dark silk coat, rich gold, a tight ear set and a baby face. His bloodlines are Carnaby, Clarkwyn, Glenmar, Millmoor and Rothby. The Yorkshire Terrier originates from England and is a byproduct of the Industrial Revolution in England. The breed was bred originally for hunting small vermin and for being a mouser/ratter in the homes and factories. Prior to 1750 most Britons worked on farms, but as mills and factories and the coal mines on which they depended for energy grew so did the need for people to work in these areas. The Scottish immigrants and their little "Scotch Terriers" migrated to northern England's Yorkshire County, where the weaving mills were located. The "Scotch Terriers" were in reality member of at least two different breeds, most prominently the Clydesdale Terrier and the Paisley Terrier. Both of these terriers had the long, silky, blue coat and semi erect ears. These larger working dogs were adept at catching rats and other small mammals. Unfortunately both of these types of terriers became extinct, but not before they had contributed to the development of the Yorkshire Terrier. Not only did the Scotsmen find work in the Yorkshire Mills, but many worked the nearby coal mines, where their dogs were welcome as exterminators. According to some the Yorkie's golden-tan legs and head were developed so they could be seen more easily in the darkness of the mine shafts. The Scotch Terriers who accompanied their owners to Yorkshire, England were indtroduced to the terriers that were already established there. The Skye Terrier the long-coated, blue/gray waterside terrier, the English black and tan toy terrier, and many believe the Maltese terrier, whose long coat and general outline is reflected in our Yorkie today! A Yorkie called Huddersfield Ben(1865-1871), who had a magnificent show record, was said to be the cause for the improvements to the terrier breed. A young reporter for the sporting newspaper "The Field", by the name of Angus Sutherland was inspired and said that the breed should no longer be called the Scotch Terriers, but the Yorkshire Terriers for having been so improved in Yorkshire County! 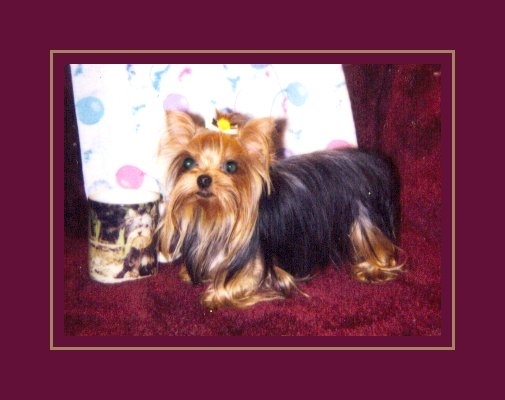 But not until 1886 did the Kennel Club of England recognize the Yorkshire Terrier as an individual breed. 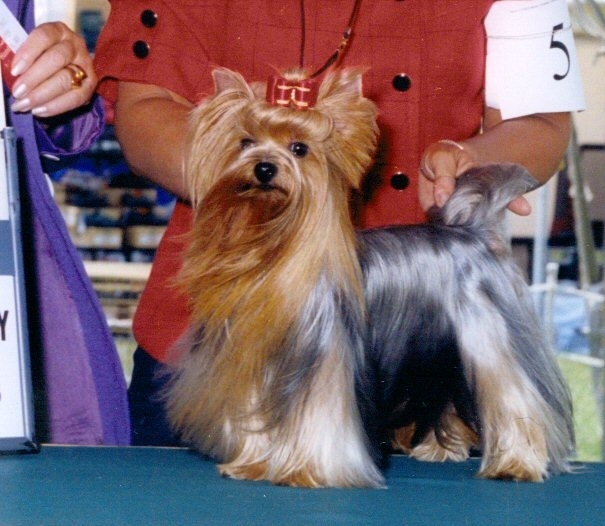 The Yorkshire Terrier came to the United States in the early 1870's and was admitted to the American Kennel Club (AKC) stud book in 1885, one year after AKC was established. At that time Yorkies were very diverse, weighing anywhere from 3 to 13 pounds! By the 1930's the modern-day Yorkie look became more universal, but the breed did not become very popular until the 1950's, where it ranked the 57th breed among 112 breeds registered by AKC and only 173 new registrations in 1949!! Today the Yorkie has over 43,000 registrations, ranking it the 9th among the 146 AKC recognized breeds! The Yorkshire Terrier is often referred to as a Yorkie. The word Terrier is often misspelled as Terrior!! Taking care of a Yorkie's teeth is very critical to avoid the tartar that can lead to infections and tooth loss at an early age. Regular brushing, chewing on toys that are meant to clean the teeth while playing. Plus using many of the dental products that are sprayed or massaged on the teeth, can help keep the teeth sound, healthy and functional for practically the entire life of the dog. Even though the Yorkie is among the smallest of breeds, it should never appear unsound in any respect, and it should also be free of skeletal deformities or gait problems. A good breeder will not let their puppy go to its new home until it is atleast 4 to 5 months old, has had atleast three vaccinations and a complete and thorough health exam by their veterinarian. The average Yorkshire Terrier can enjoy an amazingly long life, but like most toy breeds it has certain problems. Among the problems are patellar luxation, spinal cord problems and hydrocephalus. The breed's diminutive size is attractive to many people, but yorkies under the five pound range are often the most fragile. 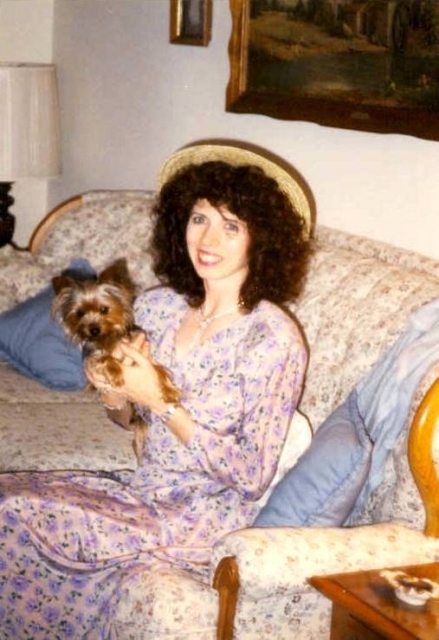 Life Expectancy information of the Yorkshire Terrier Dog Breed (Yorkies)! The average life expectancy for this particular breed is 14 – 16 years, but with good breeding/genetics, proper vaccinations, proper veterinary care, excellent home care and plenty of love and attention their life can be extended beyond the average life span. They have been known to live into their twenties. The longest living yorkie as of 2009 is 26 years old and still playing with his owner. In the picture next to this paragraph is my Habipti who lived to be almost 20 years, just short of it by a couple of months. In the picture he was just a year old and weighed 3 1/2lbs. He thought he was my little guardian angel and would protect me from anyone or anything. He crossed over the Rainbow Bridge in 2007, I miss him very much and all my other "babies" who are with him. Age comparison between the Yorkshire Terrier Dog Breed ( Yorkies) and a Human! Age comparisons between dogs and humans are always a matter of debate - we hope that the following information clarifies the situation. After the first year of life, a toy breed dog is equivalent to 12 human years. After two years, they are equivalent to an 18 year old, at three years a 24 year old, and each year after, add 5 human years to determine a dog's age.